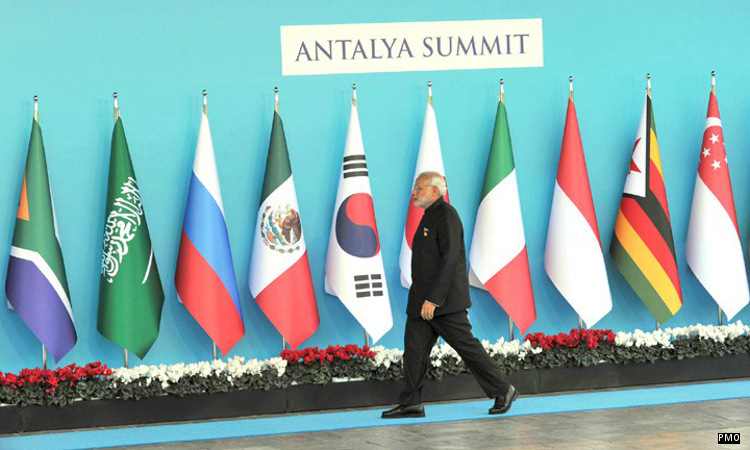 This was the declaration India’s Prime Minister Narendra Modi made at the G20 multilateral summit in Antalaya, Turkey, where several heads of state gathered to discuss the global economy, climate change and terrorism in the wake of the Paris terrorist attacks. Modi’s statement during the session on “Inclusive Growth: Global Economy, Growth Strategies, Employment and Investment Strategies” spotlighted his government’s main plans. We provide a background factcheck and also an update on the progress of the programmes. The Prime Minister’s People’s Wealth Programme, Pradhan Mantri Jan-Dhan Yojana (PMJDY), aims to ensure financial inclusion, access to financial services, such as banking, credit, insurance and pension. In August 2015, the government said it achieved its target of opening one account per household, with the exception of some areas in troubled Jammu & Kashmir and insurgency hit central Indian districts. To put the effort in context, in 2010 under the previous government, 50.6 million no-frills-accounts opened. Despite the progress, as on 4 Nov 2015, government data reveal that 37.1% (or 71 million of 191 million) of the new accounts had no money in them, zero-balance in official parlance. Heavily promoted by the government and Modi personally, Make in India aims to promote India as an investment destination and a global hub for manufacturing, design and innovation. In 2014 there was a “48 % increase in Foreign Direct Inflows (FDI) equity inflows during October 2014 to April 2015 over the corresponding period last year,” the minister of commerce and industry, Nirmala Sitharaman, said during a question in the Lok Sabha, the lower house of parliament. Computer software and hardware industry received the highest percentage of FDI with 12.5%, followed by services with 11.2% between October 2015 to April 2015, according to ministry of commerce data. The data further break down the FDI into manufacturing and non-manufacturing, and this shows that computer software and hardware attracted only $30 million (Rs.188.6cr) as manufacturing investment, while non-manufacturing investment was $ 2,457 million (Rs.15,287.14cr). The FDI related manufacturing is mainly in automobiles and engineering. ‘Make in India’ was specifically designed to promote manufacturing, but the data –for investments made between October 2014 and April 2015–suggest that most of the investment has been in non-manufacturing sectors. India still has a way to go before it regains its earlier standing. For instance, in 2012, FDI hit its peak with inflows worth $35,121 million. The government recently eased FDI norms for 15 sectors, such as defence, construction, civil aviation, broadcasting and banking. This might increase foreign investment. India’s Smart Cities Mission is meant to provide core infrastructure and improve the quality of life in 500 metropolitan areas. The government says it will spend Rs 48,000 crore ($7.2 billion) and Rs 50,000 crore ($7.5 billion) on the Smart Cities Mission and the Atal Mission for Rejuvenation and Urban Transformation (AMRUT) respectively over the next five years. So far, the ministry of urban development has sanctioned Rs.194 crore ($29.4million) for 96 selected cities to prepare city plans. The cities and towns selected under this programme consist of 24 state capitals, 24 business and industrial centres, 18 culture and tourism hubs, five port cities as well as three education and healthcare hubs. Skill India hopes to meet the challenge of skilling Indians at scale with speed and standard (quality). India requires 347 million skilled employees by 2022, as IndiaSpend has previously reported. The data show that Indians trained in various skilling programmes run by the ministry of skill development and entrepreneurship went up from 5.18 million in 2012-13 to 7.61 million in 2014-15. As many as 12 million Indians join the job market every year and no more than a million jobs are presently created. The Indian government has planned five industrial corridors, connecting various major cities. The aim is to create mega cities and interlinked industrial and transport zones with jobs and homes as India’s pace of urbanisation grows. Over two decades (1991 to 2011), more than 23.3 million Indians left farms and moved to towns and cities, according to this study by the Indira Gandhi Institute of Development Research, a think tank based in Mumbai. Of these, the Delhi-Mumbai Industrial Corridor has made the most progress, especially after a memorandum of understanding was signed between the governments of Japan and India in 2006. Three more corridors, connecting Chennai to Bengaluru, Vishakapatnam to Chennai and Bengaluru to Mumbai are under planning. The feasibility study for final industrial corridor connecting Amritsar to Kolkata is on. This FactCheck exercise and report is a joint collaborative effort with members of the Global Fact Checkers Association timed with the G20 Summit in Antalya, Turkey.